While most American universities have stopped requiring its college students to prove they can swim for graduation, Japan has stayed true to its traditions. The academic requirements have not changed in the Far East. Japanese universities still require its students to demonstrate their aquatic abilities for academic credit. And it is not just swimming back and forth in a calm, warmed, chlorinated pool. It is far distances in the surrounding seas. That is certainly one proven way to educate an entire population to be water safe: swim to graduate. As an island nation, Japan has enjoyed a long history of swimming and its population being water safe from junior high school pupils to university students(see below). While relatively few Japanese college students are competitive swimmers, open water swimmers, marathon swimmers, or channel swimmers, a vast majority of the population is at least water safe. And that is a good things: slow breaststroke or whatever style can get them from one shore to the other is still a valuable life skill. 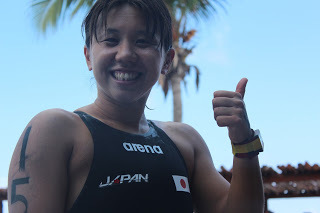 Photo shows Japanese Olympic marathon swimmer Yumi Kida.